A family with a great love for practical jokes is haunted by the family ghost Mr. Boogedy. One year after the Davis family defeated the hideous ghost of Mr. Boogedy, the evil spirit returns once again from beyond the grave by haunting the dreams of the Davis children, determined to get his revenge by re-acquiring his magic cloak back as well as seek a new mate for himself in his own hellish afterlife. Can Mr. Boogedy be stopped this time? Written by Larry B.
Corwin Davis: We knew that. Who are you? Lazarus: I'm Lazarus. I dig graves. Jennifer Davis: Uh, huh. Sounds like fun. We gotta go. Lazarus: Wait! Don't you want to see it? Although I don't remember much of this film to write a really good and helpful review of it, I do remember that I particularly enjoyed this film when I was younger. I probably caught it in my early teens or just before, and I watched it several times with my brothers (who are around my age). We couldn't get enough of this film. It was not a scary film, but it was particularly comical and downright silly. It had something to do about a house that the family moved into which was haunted by 'Mr. Boogedy'. 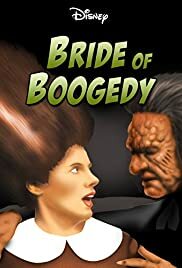 The first film was about Mr. Boogedy, and in the film, he went to get a wife. I think he choose one of the girls in the family. The catchphrase of Mr. Boogedy was 'Boogedy Boogedy Boo!' It was a very silly film, but we really enjoyed it as children. It is just right because it was not particularly frightening, and it is a good film for older children to watch around Halloween.